Concert is a part of Savoy JAZZFest. Duration of whole night 2,5-3 hours, incl. intermission. Jussi Lampela’s new piece Jazz Noir, premiered in early 2018, sweeps the listener to the dark alleys and mysterious scenes of the 1940s and 50s crime jazz and film noir. Inspired by fatal liaisons and hard-boiled classics, the composition is an audio-visual experience for big band, two soloists, sound tape and video projection. In cinema, jazz has often used to portray human vice and crime. Indeed, Lampela’s project has countless models in the hall of fame of Hollywood’s score composers from Elmer Bernstein to Henry Mancini. In the concert, UMO will be fronted by A-listing Finnish stars saxophonist Jukka Perko and trumpeter Jukka Eskola. To complete this thriller, a video installation by video artist Joonas Tikkanen and audio tape excerpting some of the most important political speeches of the era will be playing throughout the concert in the background. 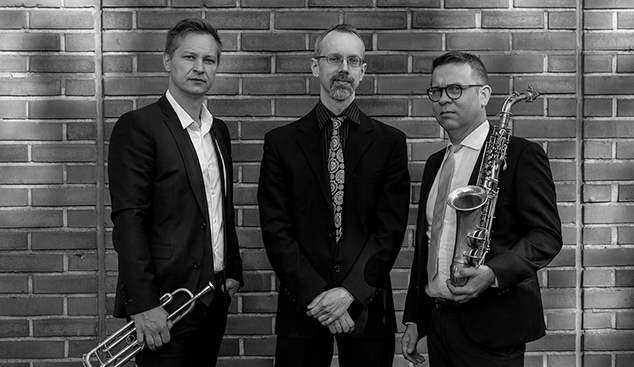 Premier at Turku Jazz Festival in March 2018; Turku Jazz Orchestra, Jussi Lampela, Jukka Perko & Jukka Eskola. Jussi Lampela (b. 1972) is a Helsinki-born composer-arranger and guitarist who specialises in writing and arranging music for various sorts of outfits for live, recording and screen purposes. He has composed for and led his own group Jussi Lampela Nonet since 2010, and in the same year their collaborative album with trumpeter Jukka Eskola, Lampela X Eskola, was nominated for the Jazz Album of the Year in the Finnish Emma Music Awards. Some of his major collaborators include Vantaan viihdeorkesteri, Kuopio Philharmonic Orchestra, Oulu All Star Big Band and drummer-producer Teppo Mäkynen, and he has also worked as an orchestrator and arranger for Finnish composer Pessi Levanto and Janne Huttunen’s feature film productions. Furthermore, Lampela has made a name for himself as a sought-after teacher. Saxophonist Jukka Perko (b. 1968) counts among the best-known and most decorated names of Finnish jazz. He played in UMO’s ranks in 1989-1993 and after that he has often featured the orchestra as a soloist. The versatile artist has released nearly two dozen albums with various groups – some of which on the legendary Blue Note. In addition to his own recordings, he has appeared on dozens of discs by other groups and artists. With already a fine and long career behind him, he has always found ways to shed his skin for fresh, unprejudiced music. Concert is a part of Savoy JAZZFest. During the same night there will also play Billy Cobham: Crosswinds Project. Duration of whole night 2,5-3 hours, incl. intermission.